At 20.38 at day 6 Regine got the picture, she was waiting for since such a long time. Influenced by the roadtrip i had back in the 80ies and the bad weather we had on our 2007 sail on MS Lofoten, when they had to renounce the Nordkapp trip (i was not so fascinated by this rock, that i wanted to go there twice). Since then this target was part of each where-to-go-in-holidays-next discussion, and even more since we bought the campervan, i finally gave her as christmas present a voucher for a cup of coffee --- at the Nordkapp. And so here she redeemed it - even with additional waffle! And another postcard view of that particular rock. 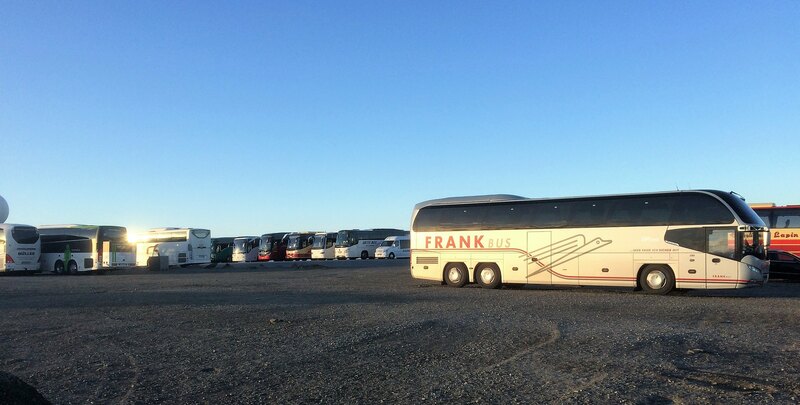 When midnight came nearer the parking space filled up with coaches from various hotels, ships and where ever from. The place became very crowdy, since we had a cold wind, many people watched from the inside. And here the view to the rock at 0.00 o'clock. And although that was summer-time and the real 0.00 o'clock would come one hour later, all people disappeared, the buses left and the place was empty at real midnight! The total distance is 3.500 km and we made that in five days and one day break in Malmö. From now on we would slow down a lot. But we wanted these pictures and such weather!! Last edited by Ralf__; November 22nd, 2018, 16:39. 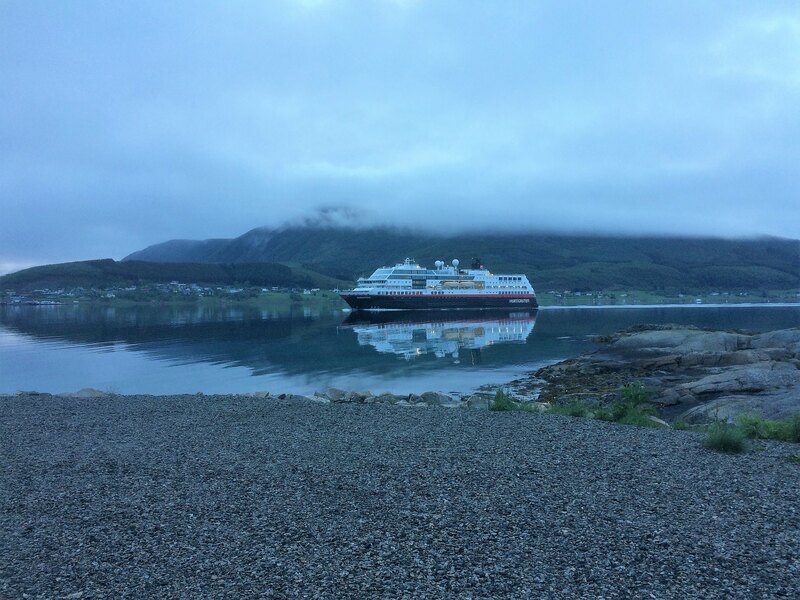 We reached Honningsvag, as the Northbound MS Richard With was coming in. 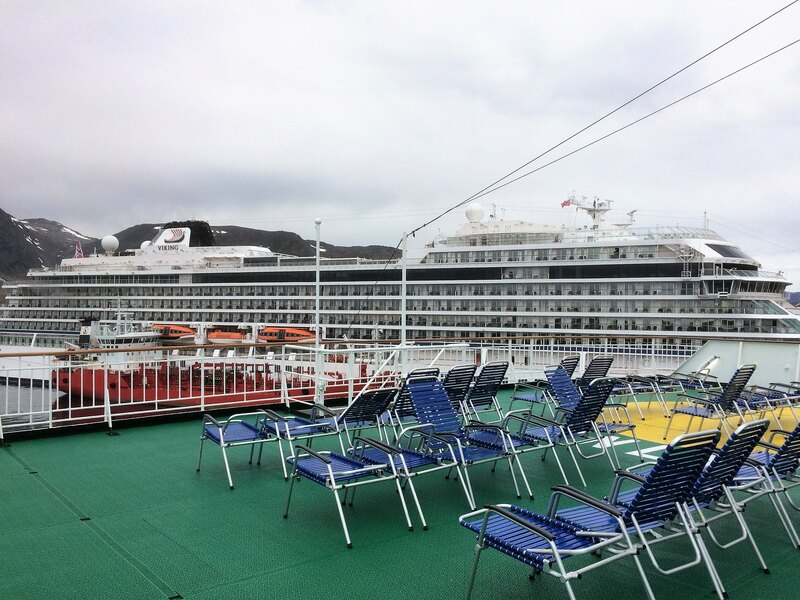 The best viewpoint to watch the scenery would be her sundeck. So we went aboard. Cruiseship architecture. MS Viking Sea. MSC Meraviglia hat to anchor outside. We decided to leave before the crowds would come into town. 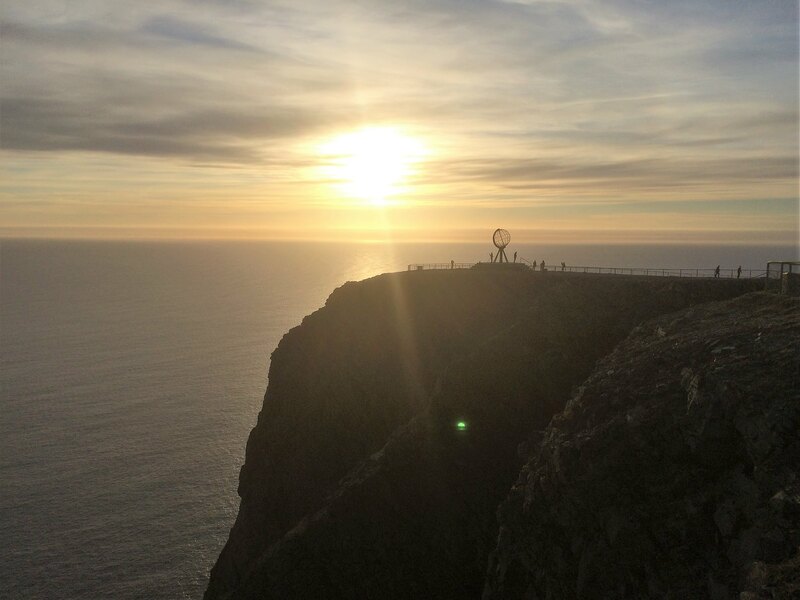 So we left the island with the cape of the continent on it through the Nordkapptunnel, which gives you at least the adequate feeling. We made it on the road from home over the Sundbridge and through the tunnel. In earlier days, when you needed the ferry, it was more strange. I had the region and the road around Alta in good memory. It was beautiful there. 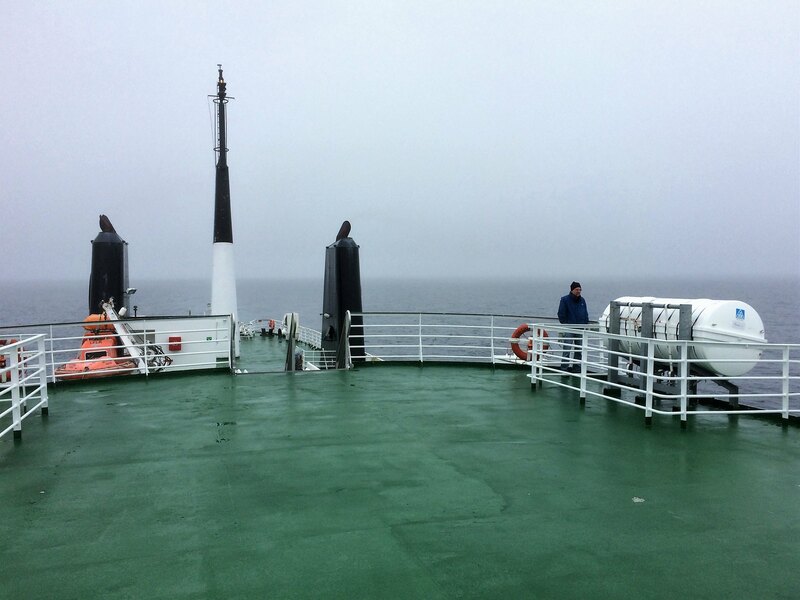 But we had wonderful weather at that time, while it was grey on the cape. Now it was the other way round and the modernized road made this leg quite boring. 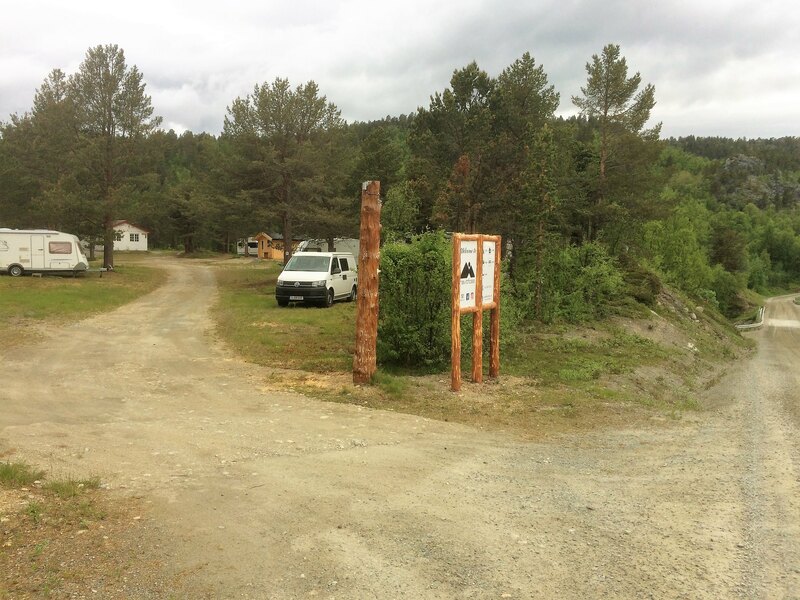 As i was searching for places for our overnight stays, i found a very vague notice about a campsite near a waterfall at Kvaenangen. And that was not easy to find! No result with Google, no sign. But we wanted to see at least the Navitfossen. And this is worth a visit. 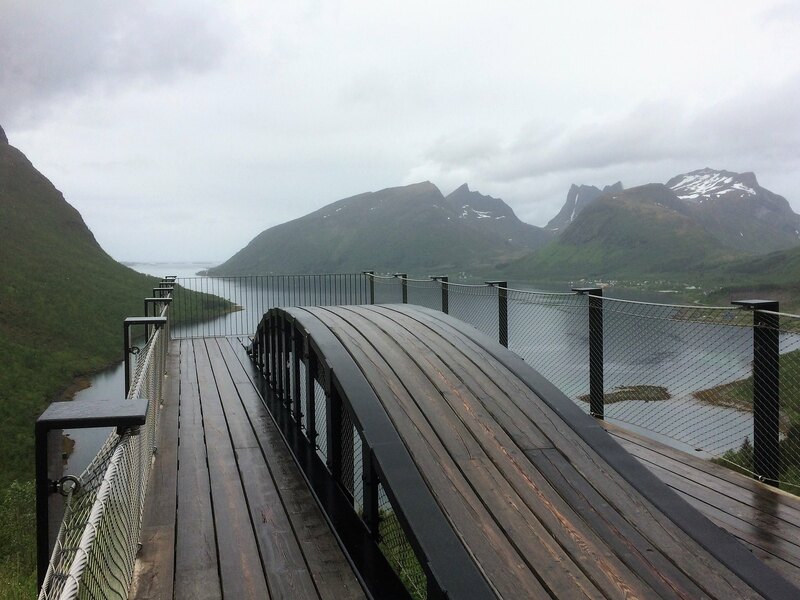 Completely different than the switch off waterfalls in Sweden. 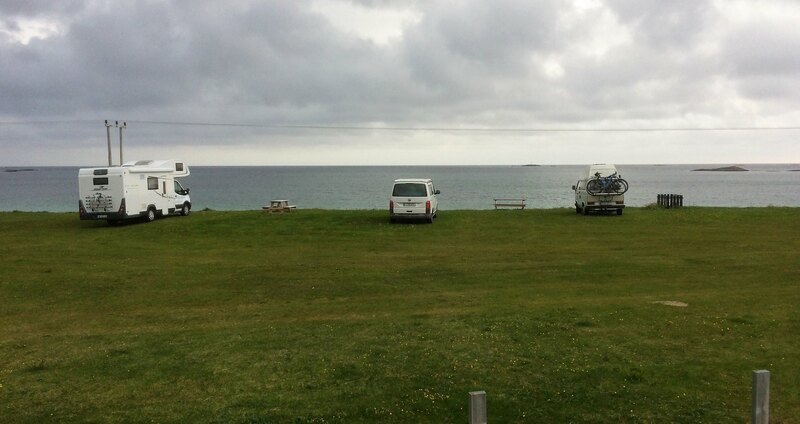 And a few meters further up the road there was the campsite. 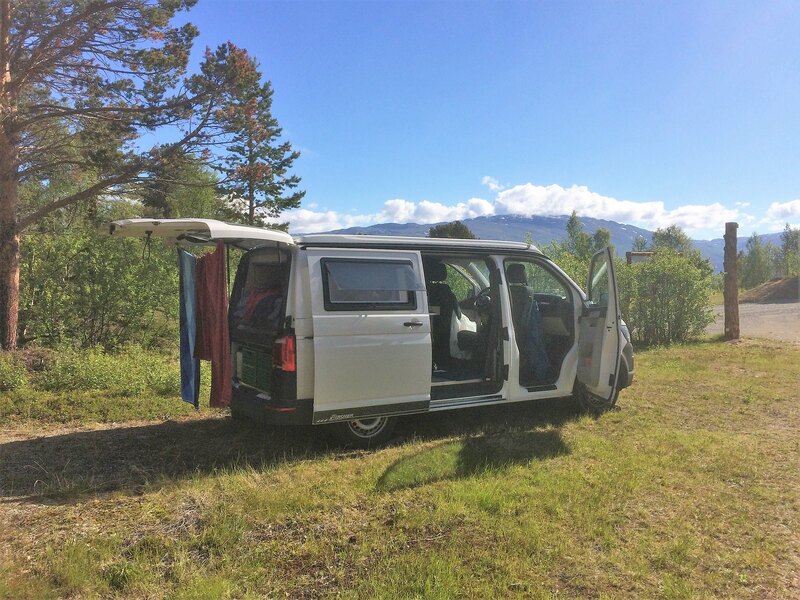 Abandoned, just some empty long camper vehicles, but in good shape, facilities nearly new and you had the sound of the waterfall. A phone number had to be called and some minutes later the owner came, opened the facilities and we paid a fair amount. Later an English student came with a tent and kept a big distance and that was it. Wonderful place! Strange feeling. We were just one week on the road and already on the way back!! 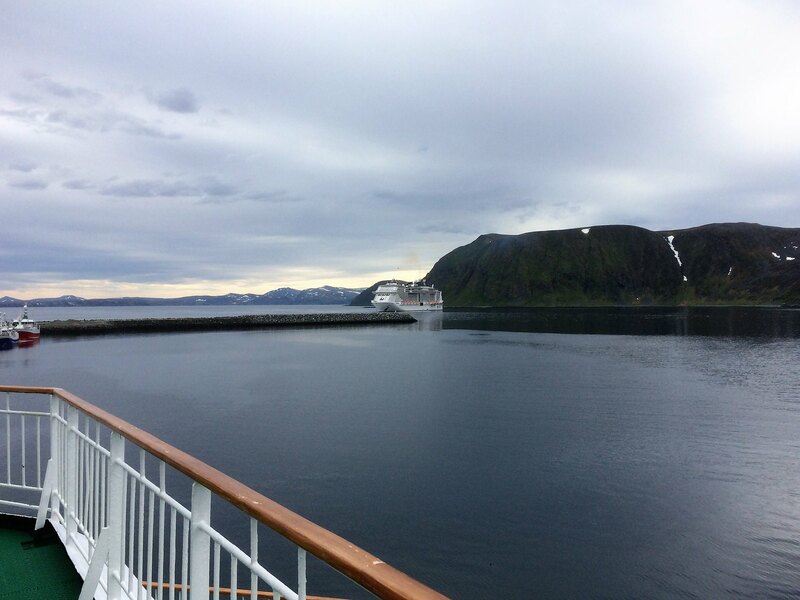 But we had three targets, Nordkapp - the Lofoten islands and a minicruise in three & a half weeks. So we were right in schedule. And what a good view as we opened the door: Wonderful weather. I intended to make the shortest way as possible on the E6, to avoid the Lemming-row of campervans. 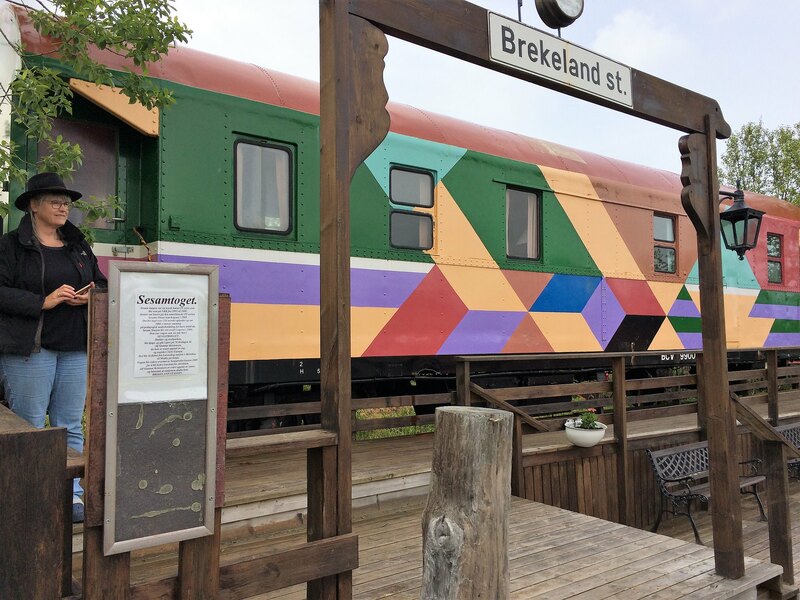 That was also the final decision for the Inlandsvägen (E45) in Sweden. And that had been a good decision. 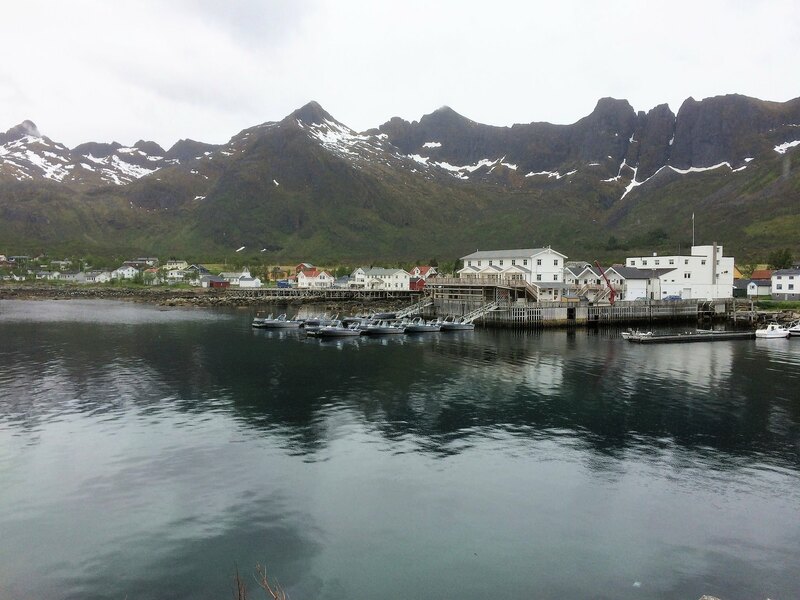 So we stopped in Olderdalen to take the ferry to Lyngseidet, later Svensby - Breidvik, have a stop in Tromsö and then further to Brensholmen to the ferry to Botnhamn on Senja island. 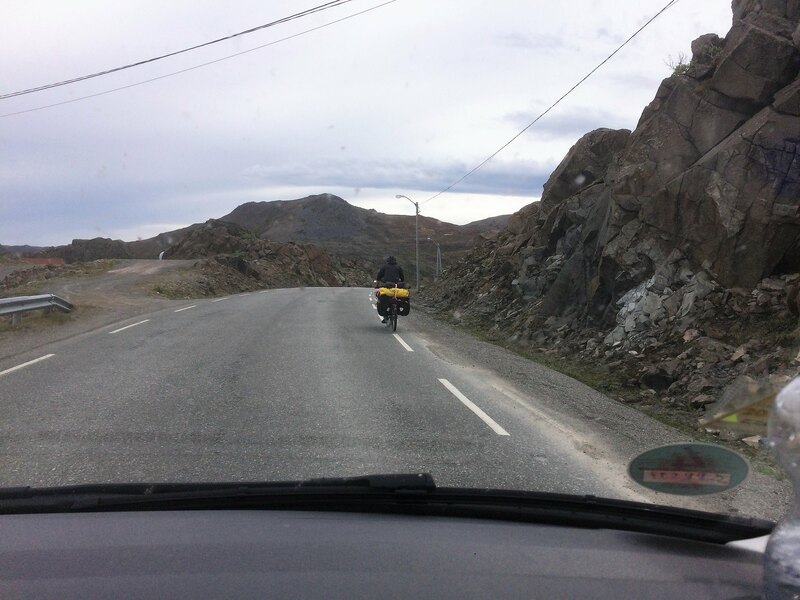 From there we wanted go over to Andenes the next day. 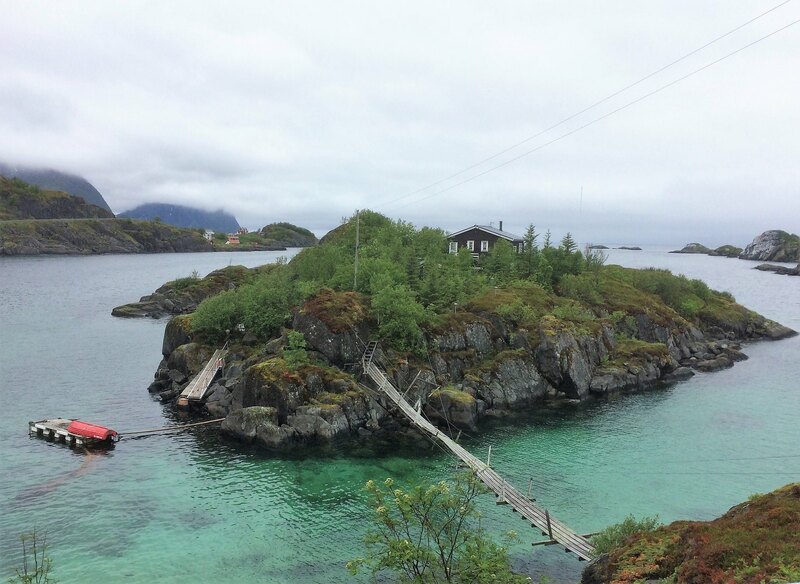 So we were in Olderdalen to the right time, but no ferry showed up. Nobody had some information and the queue became longer and longer. 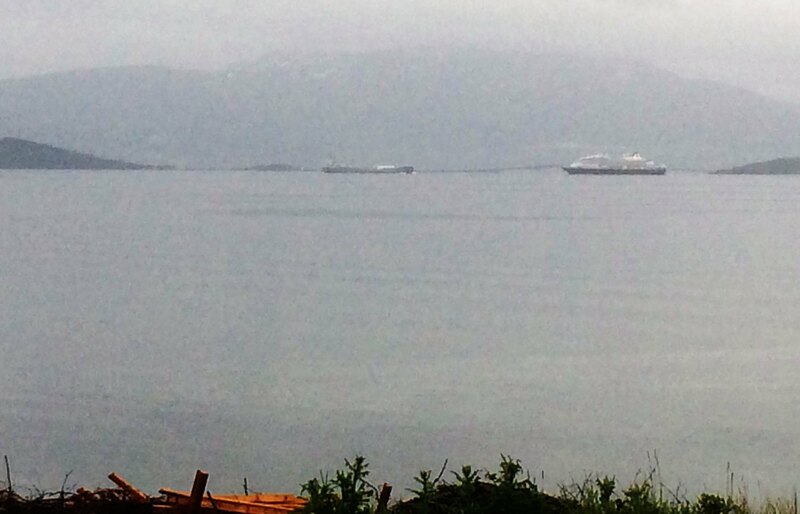 The next scheduled ferry arrived. Some had to wait then, but we were first in row. At Lyngseidet we saw the reason for the delay: they were just towing away the second ferry apparently due to technical problems. 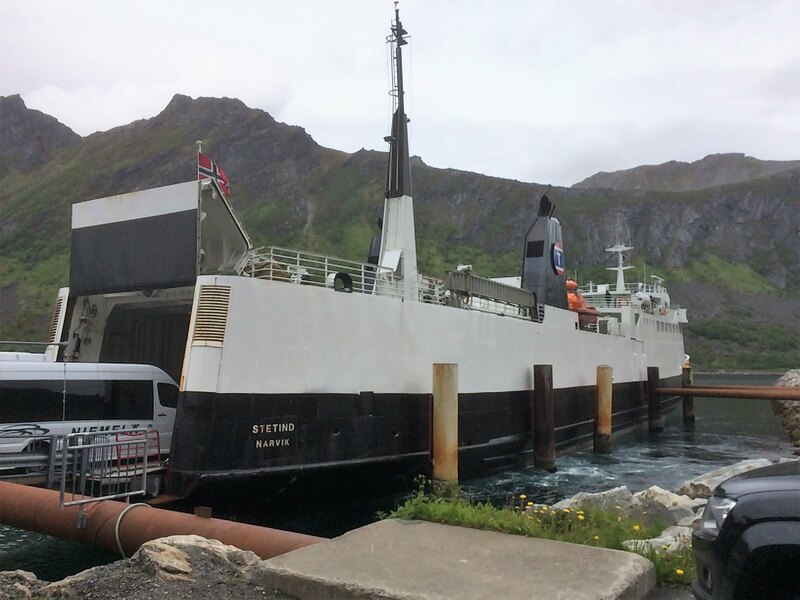 Funny, that here two quite small ferries serve a long distance, while Svendsby - Breikeidet is served on a very short distance with a ferry with maybe triple capacity... well, should work anyway normally. 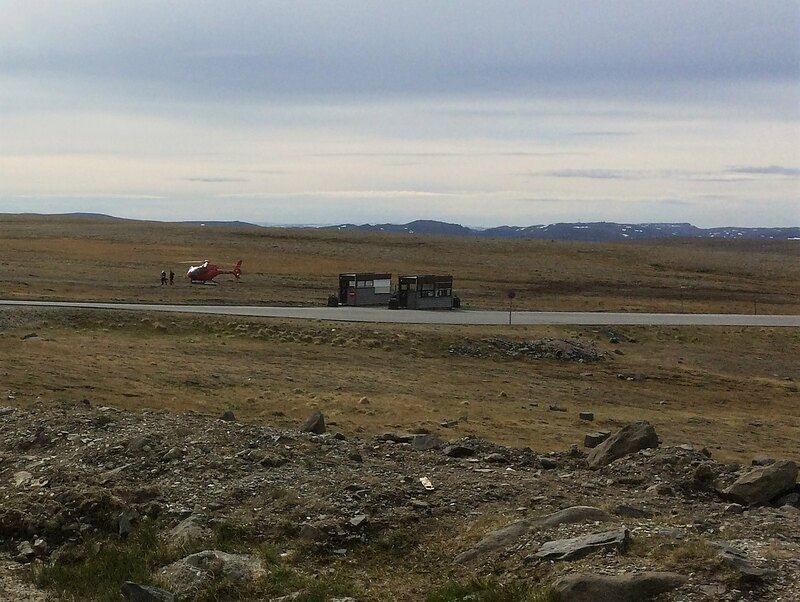 High clouds and fair sight in Tromsö, so up with the Fjellheisen cable car to admire the wonderful panorama. I do like the way you smile Ralf.But I have to say that Regine's one is a bit more expressive! I guess that ferry in #19/2 is Vaggassvarre. 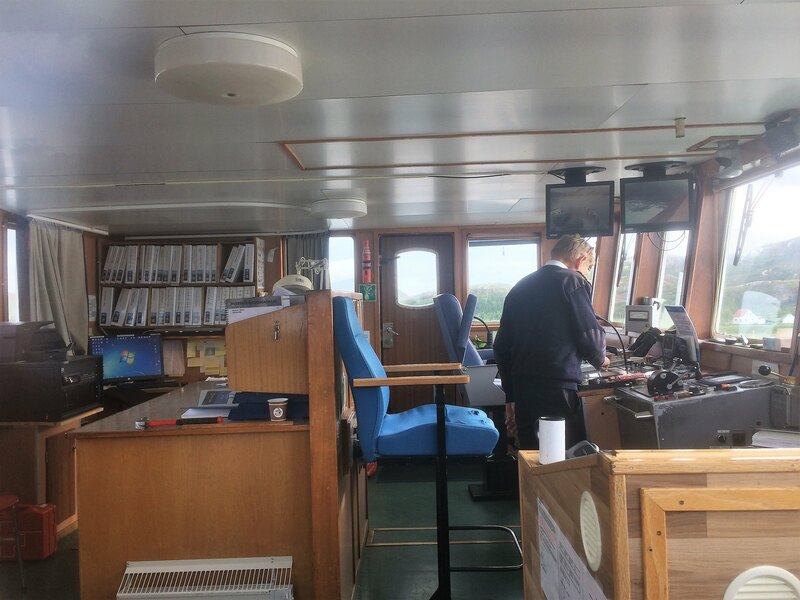 Have travelled alot on board her, as she sailed as Gjemnes for the MRF company here from 1979 to 1992, in the Kvitnes-Høgset strech, not far from my home. 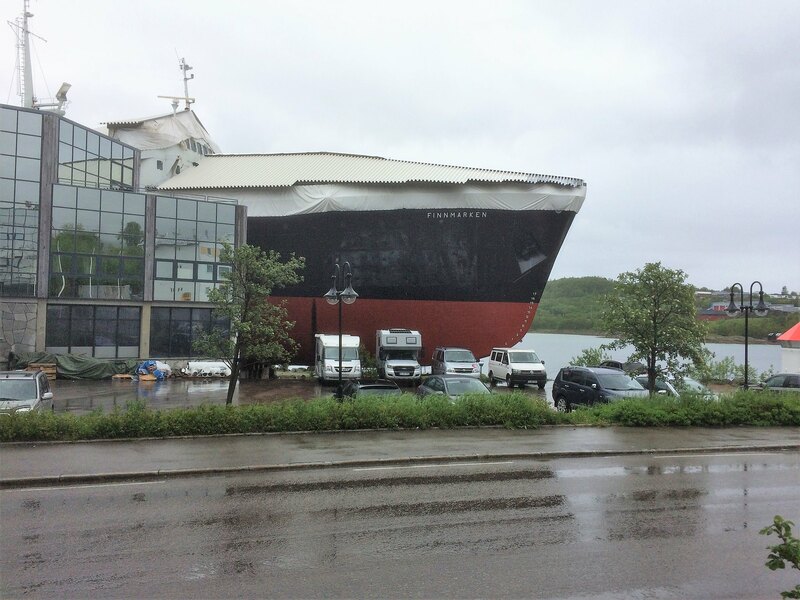 She also sailed Kristiansund-Tømmervåg as a reserve ferry in the summer of 1992 before being sold. We took some fuel at a reliable petrol station near the airport, no visit of the city this time, we had to reach the ferry to Senja! And she arrived shortly after we reached the port. MF Helgöy is a nice classic ship from 1978. I was really happy when she came. As soon as we were aboard we had the unresistable smell of fresh waffles in our nose. 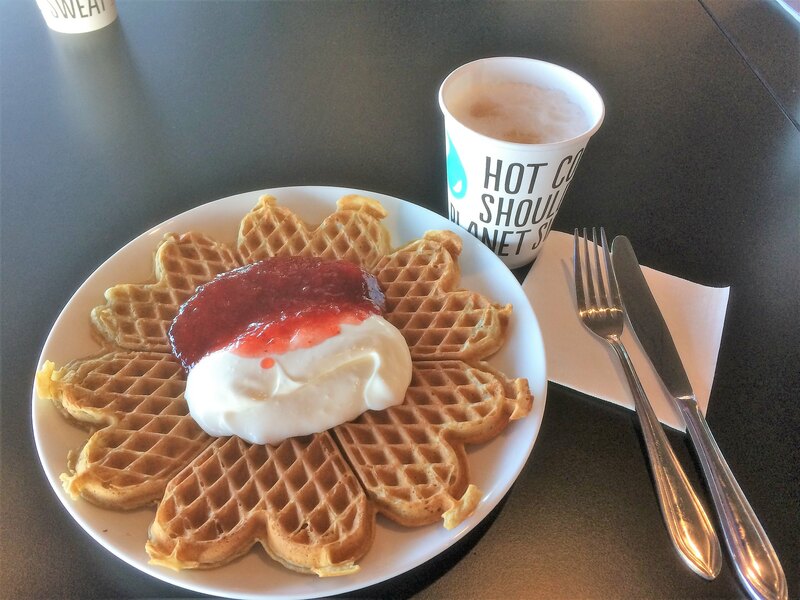 So the first way was downstairs in the salong to get such waffles. And then up near the Captains place. Senja welcomed us with heavy rain. 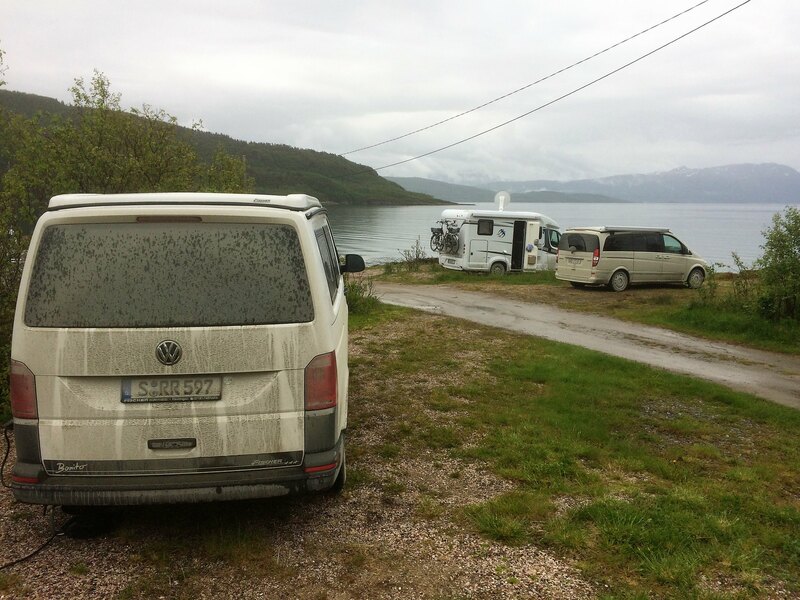 So we took the direct way to Fjordbotn Camping. 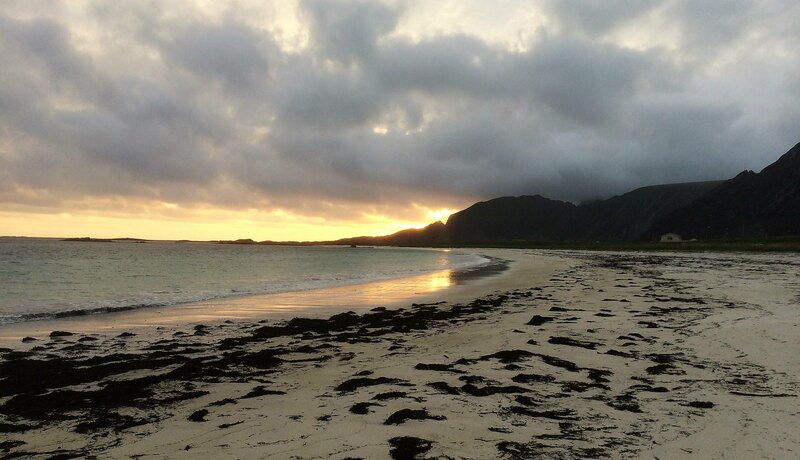 After cooking and having dinner we prepared for the Lofoten Islands. #20:1 - that's a more stylish way to take a selfie! Actually both fine and clever photography! By the time I got to that Finish part, it was really early in the morning. I think we arrived at Lakselv around 7 in the morning. I don't remember so much about the roads or the views, other than seeing a lot of shacks and badly maintained houses and properties. I was more or less in some sort of coma at this stage of the long drive from Trondheim. I remember starting at Trondheim just before lunch, only making random WC-breaks. 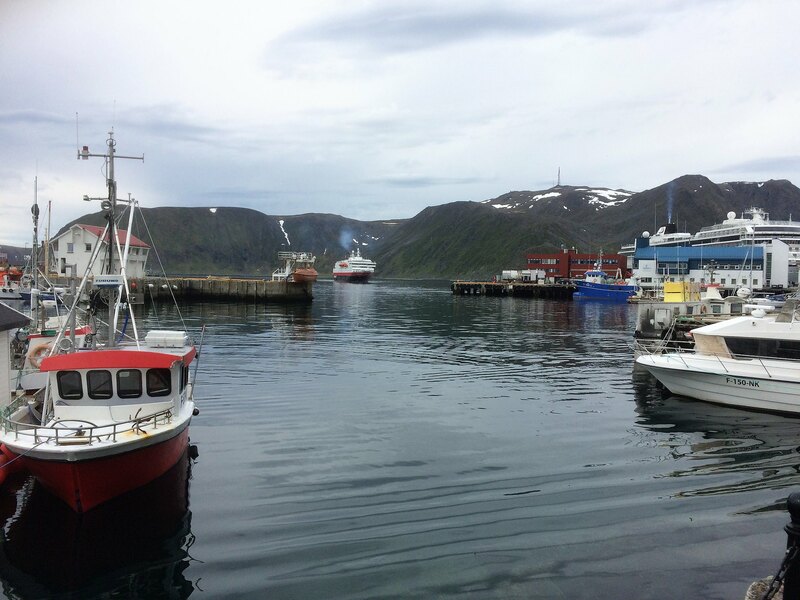 I think first stop (for sleep) was Honningsvåg. 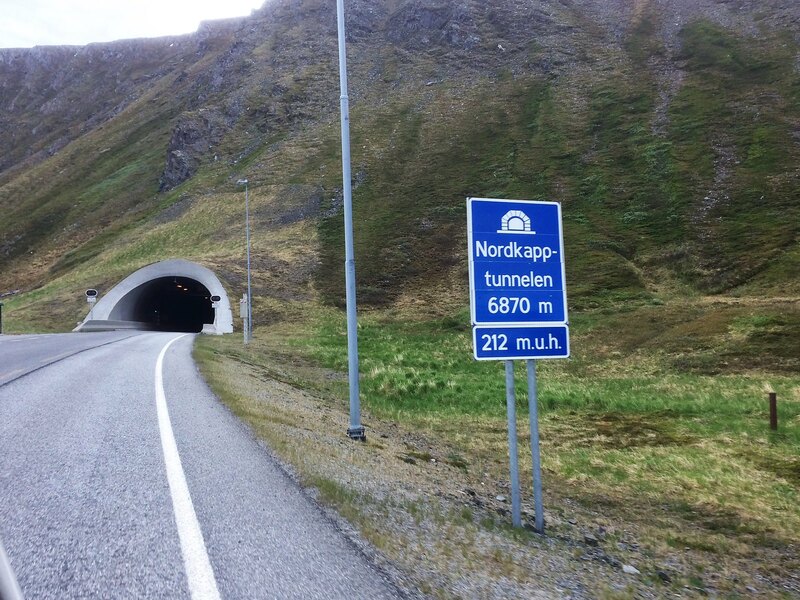 I do recognise your image taken just before the opening of the tunnel to Honningsvåg. This one is clear in my mind. Glad Regine got the globe to her self long enough for that infamous "been-there-photo". I guess you had to wait in line for a while? The waffle seems like an appropriate award after such a long drive. 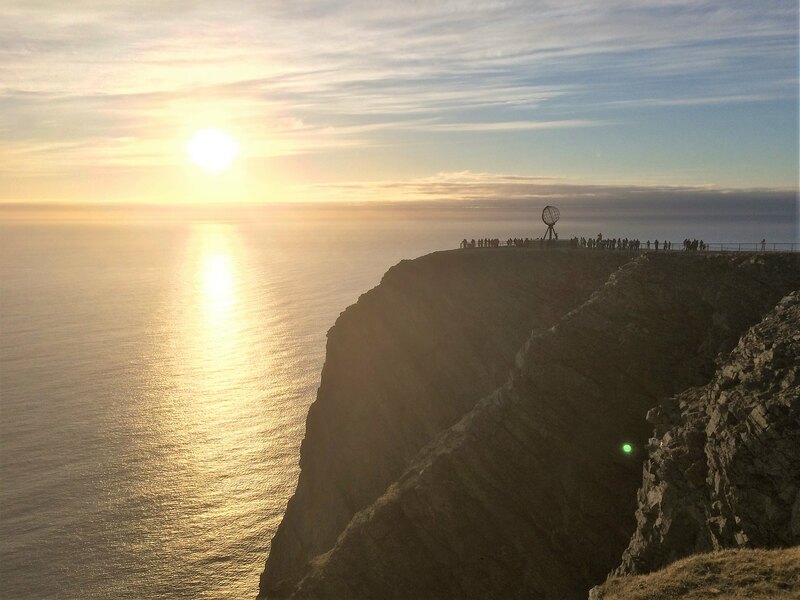 Seeing that midnight shot of the North Cape plat, I'm sure that exact moment was a summer memory that will stay with you for a very long time. I have to say that the "selfie" (yes, they are underrated!) 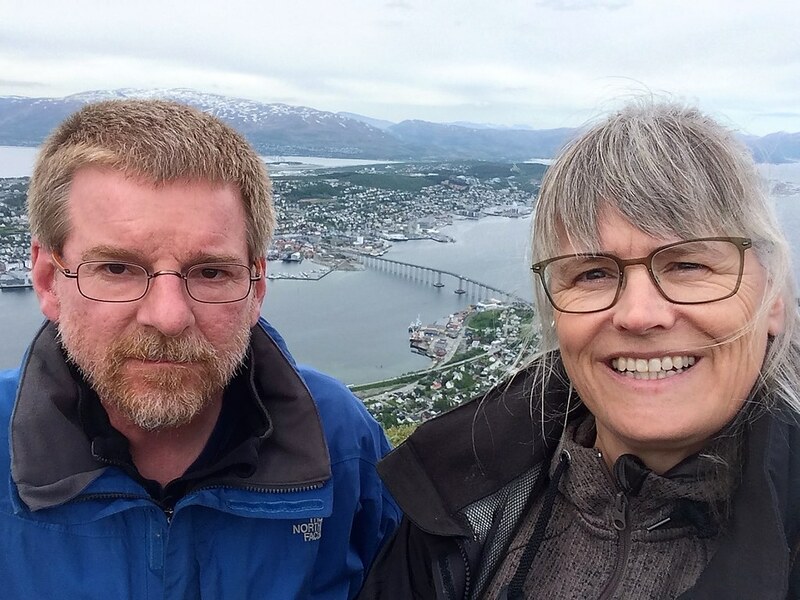 from the mountain above Tromsø is a wonderful image. Selfie is not as bad as it gets the rap for, sometimes it's all you can do especially when you are on your own. This is certainly a trip that you both enjoyed, and I feel so proud and happy that you were so lucky with the weather too. 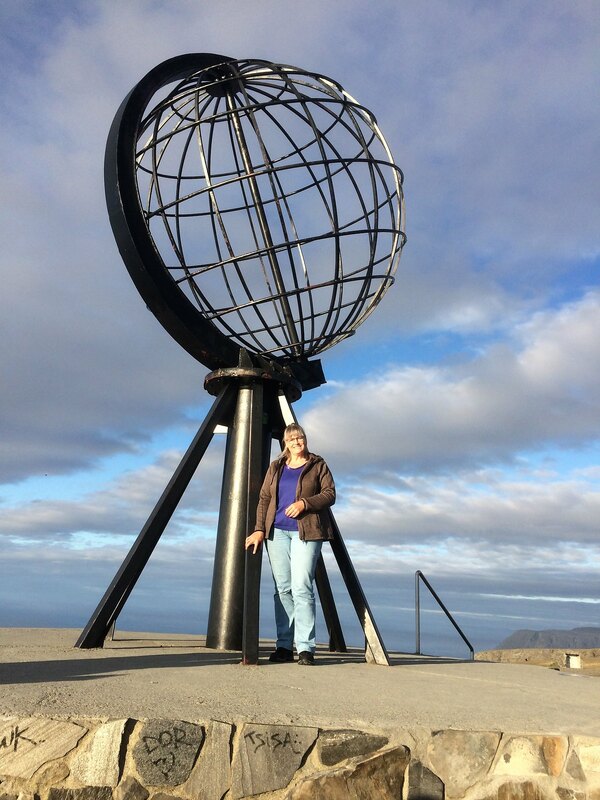 We stayed at the Nordkapp over night, so there was a lot of opportunities to take globe pictures. It was only very crowded there when there were groups with busses. Inbetween it was quite calm there, so this is just the one selected as best of. Thank you all for your nice comments. Did you also visit the Thai Museum (inside the mountain) that was created in remembrance of King Chulalongkorn's visit back in 1907? Yes we did. I remembered when i saw the sign. For Regine it was a strange experience, but i explaned her that this has a special meaning to you and many other people in Norway. Glad you got to visit. For me, this special little room offered a lot of insight into a historical event for Thailand's King Chulalongkorn. This King meant so much for Siam during his reign, and for the kingdom in the years after. Also, this room was set up as a Buddhistic shrine, and I found a lot of solitude there paying my respect to the statue of the King. Indeed, a moving and meaningful place to me. Weather was not really better the next morning and we decided after breakfast to start and follow the National Scenic route of Senja. 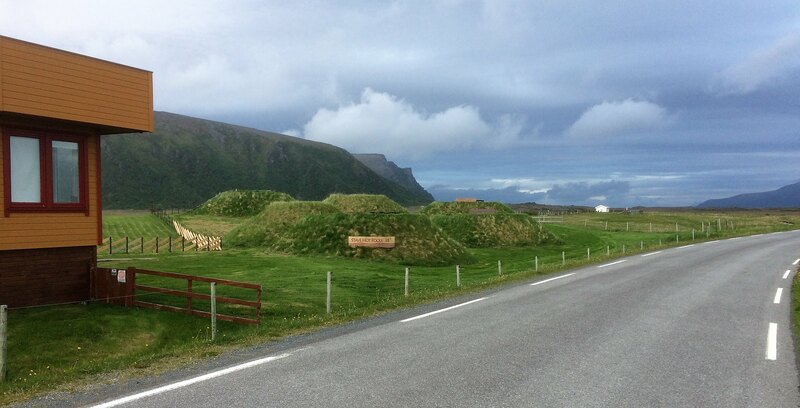 This roads follows the Northern shore of Senja. 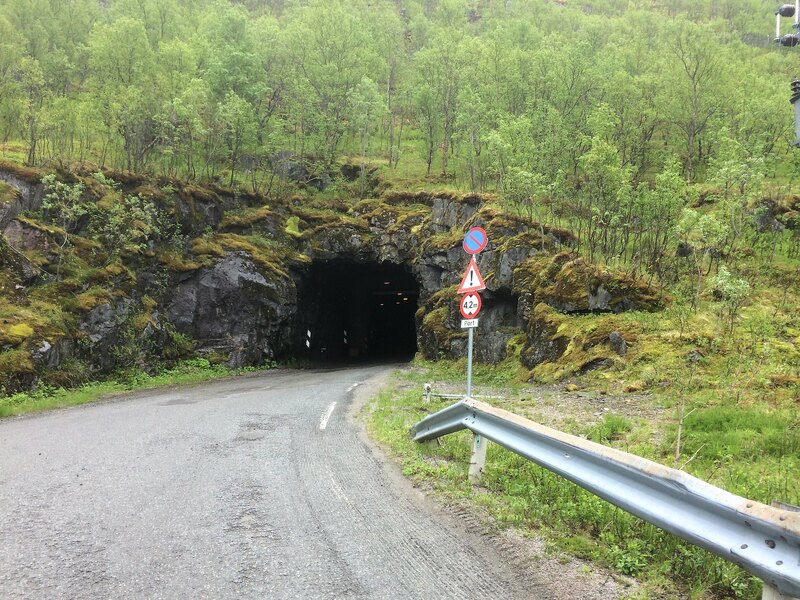 After some kilometers a tunnel entrance attracted me and i decided just to drive through. Fjordgard on the other side had a small harbour with some fish industry, but nothing special. Really worth a stop are the view points on the Scenic Routes, not only because of the view but also because of the architecture. A camera team came over from Russia to make fashion pictures. Uuuh, the girl was freezing!! Even in rainy weather, the next viewpoint was also stunning. 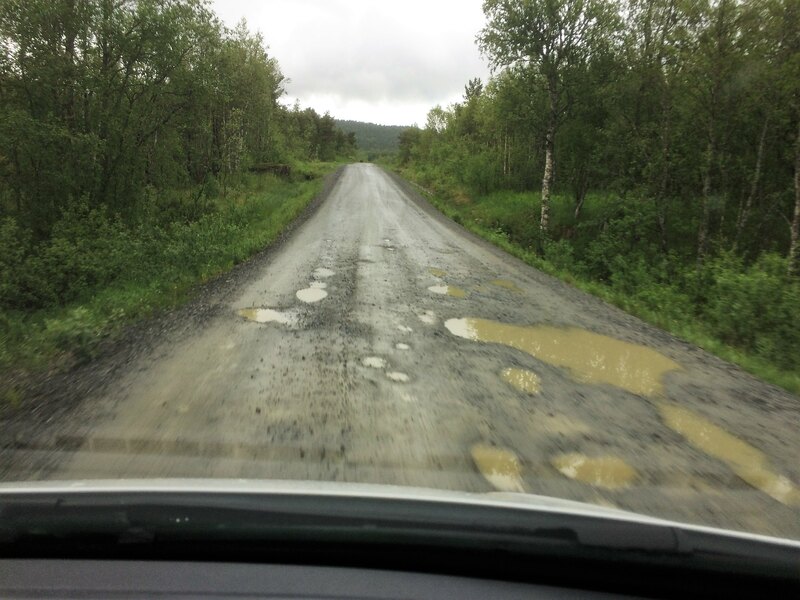 These roads are really attractive to road tourists like us. A few kilometers further the road we came to Straumsnes and here you can find the Senjatrollet, we saw some adverts before. 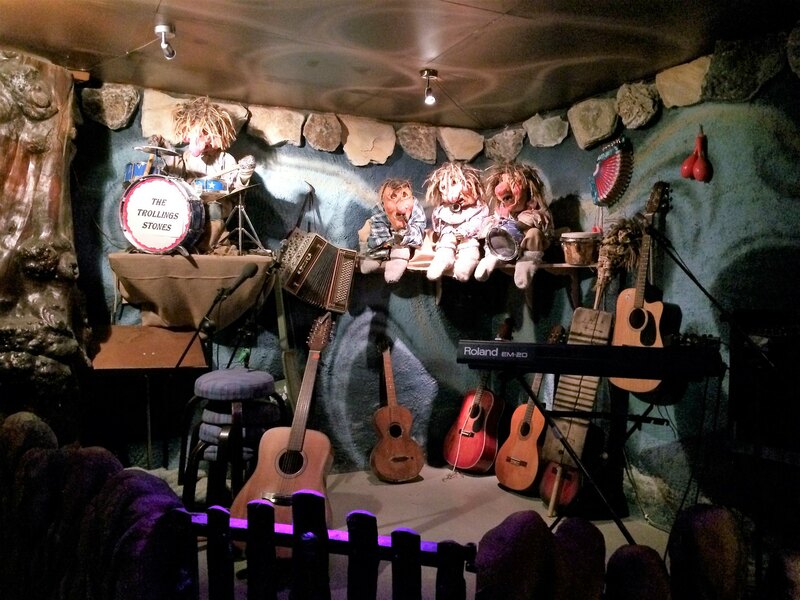 Regine was sceptic and i did not know if this is an attraction only for small children. But there was the entrance and a sign was offering free admittance so we gave this place a try. A café was offering refreshments and homemade cakes. And of course there was a huge gift shop with the biggest variety of Troll devotionals i have ever seen. Figures, cards, books, games... everything. Outside there was an exhibition of various things which had been found nearby, tractors, a fishing boat and a lot of old stuff. And an old railway wagon. 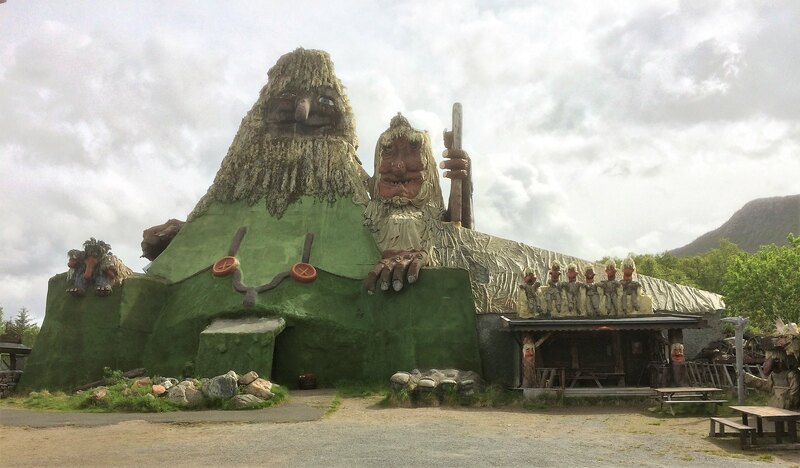 A sign stated that this was the original studio of the Norwegian Sesame Street! What a crazy idea! The next railroad is far, far away in Narvik! If you want you can stay overnight in it! Or celebrate your birthday! 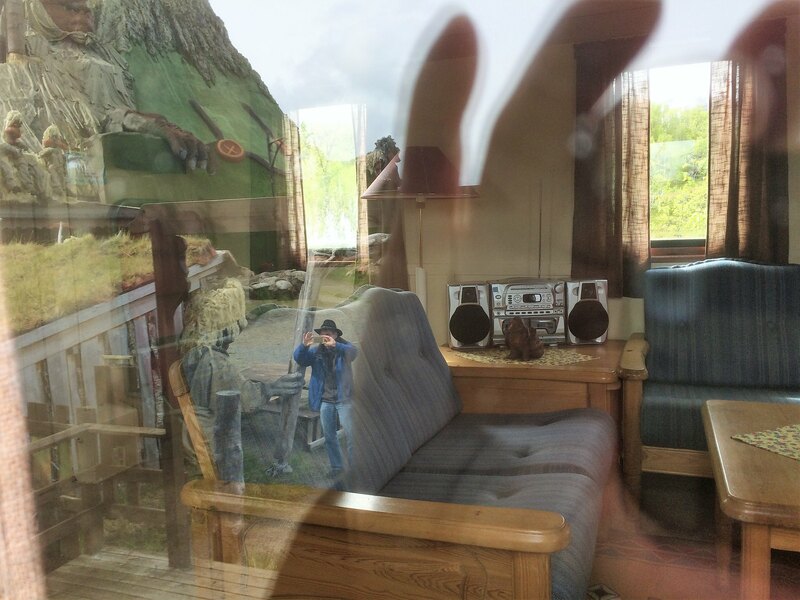 We tried to get a glance inside and Regine created a quite creative mirror picture. The heart of the whole installment is this building and go in there requires a remarkable entrance fee of NKR 140,-. I convinced Regine to go in and it was getting more crazy. A whole lot of selfmade caves with a lot of selfmade trolls in it are telling wild stories and sagas. All built up with tons of mostly papier-maché. Sometimes you can also hear and see the Trolling Stones. 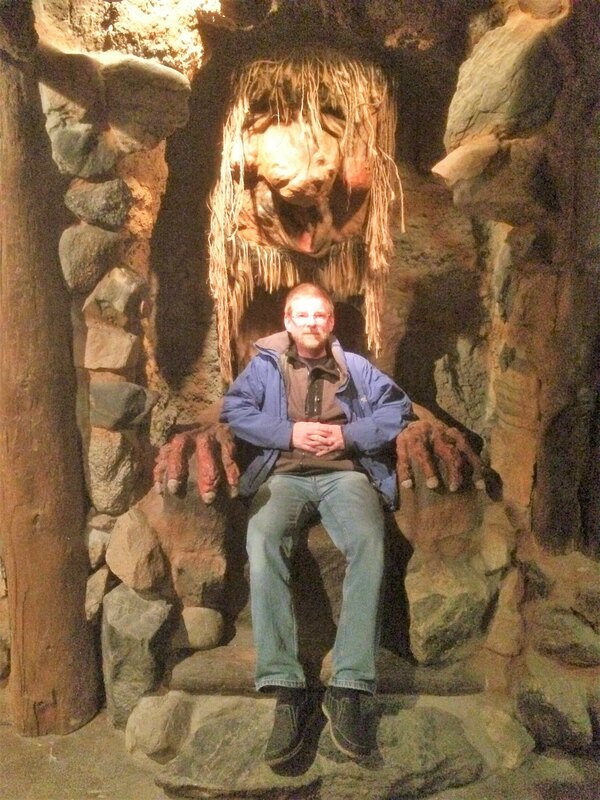 There was also a library with thousands of troll books and a big Troll throne. Really cute was the baby-soother-corner. 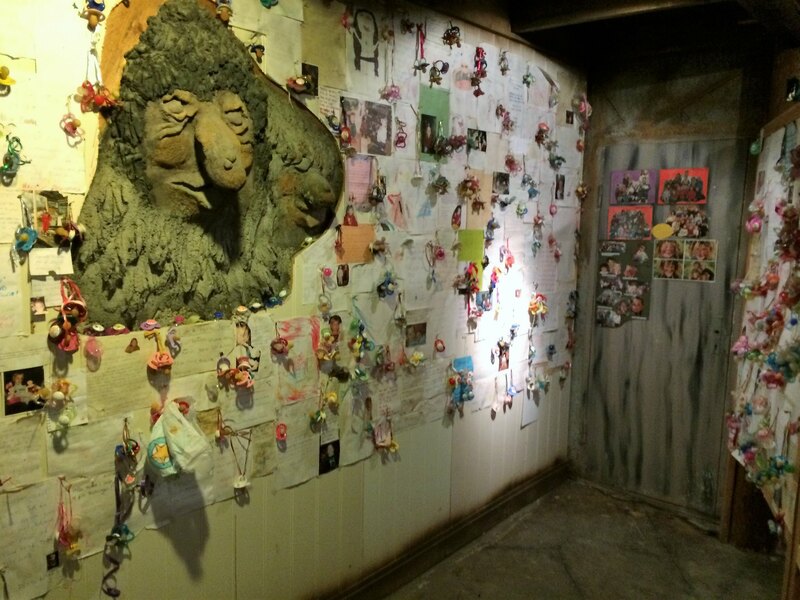 The kids can let their soothers here and tell the trolls that they are now big enough and don't need them anymore. So they can donate them to the Troll children, which will use them during the night. After having seen all that, i was glad to spent the entrance fee for such a crazy work from just one man. Really! Last edited by Ralf__; November 23rd, 2018, 17:08. 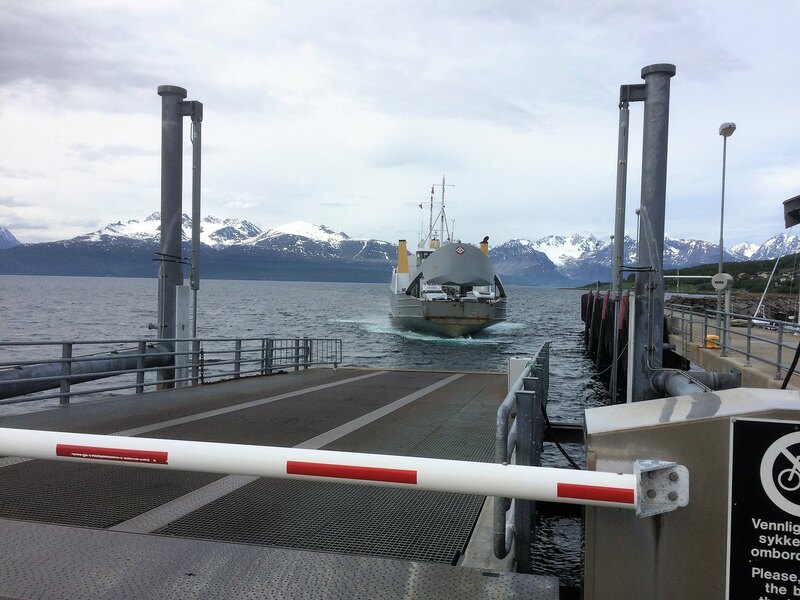 The end of the tourist road is the ferry terminal to Andenes in Gryllefjord. But we did not enter the ferry. 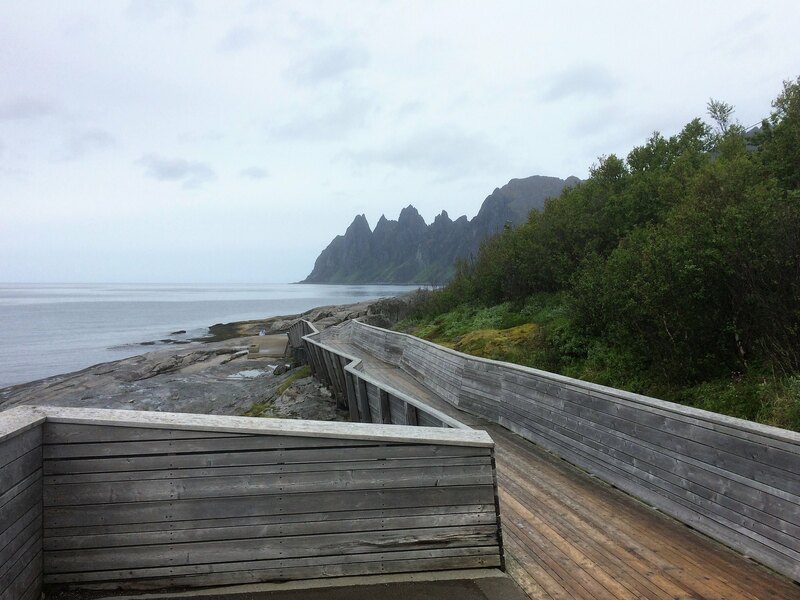 We decided to stay one day more at Senja, since we had seen just the Northern part. But first we watched the ferry been loaded and leaving. And we knew, we had to be early the day because it was full. 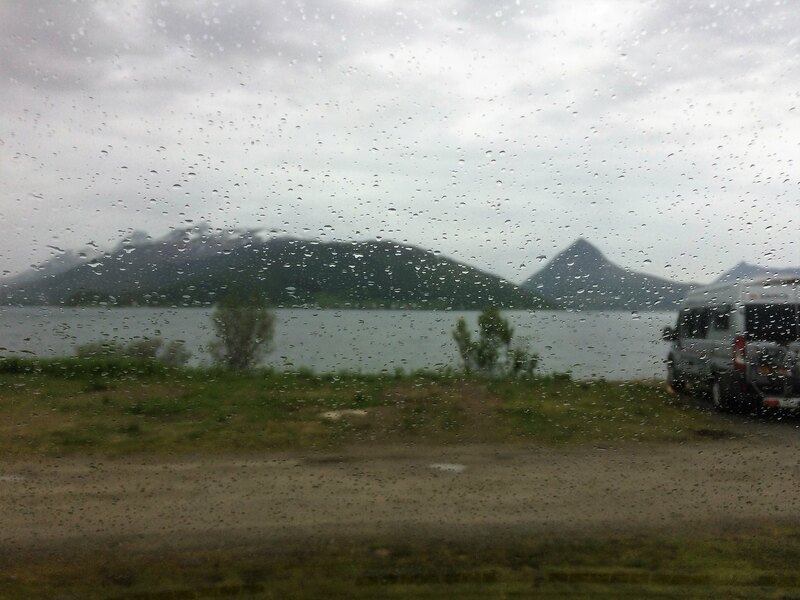 We drove a bit around, but did not made more pictures because it was raining more and more. But we had a lot of fun on the gravel roads. 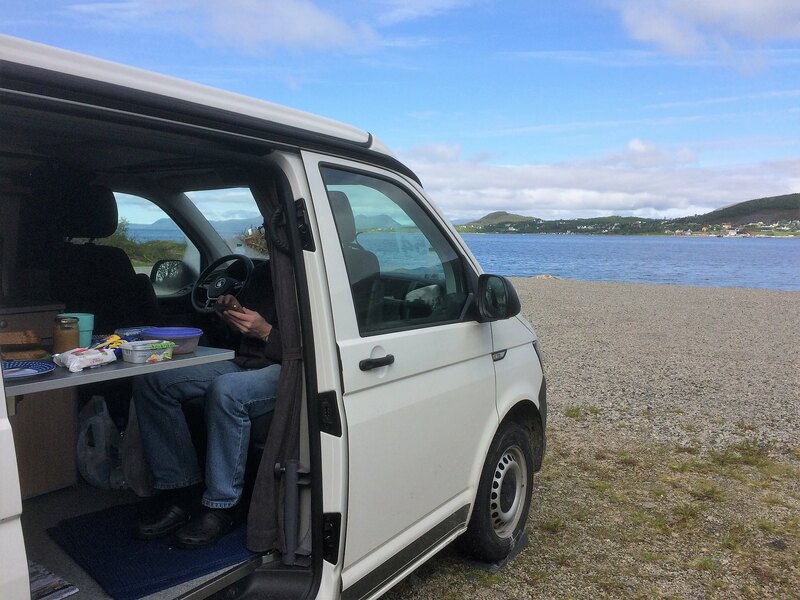 A campsite at the southern shore attracted us and so we stopped there for the night. You can cleary see the traces on our car. Last edited by Ralf__; November 23rd, 2018, 17:07. Midsummer! 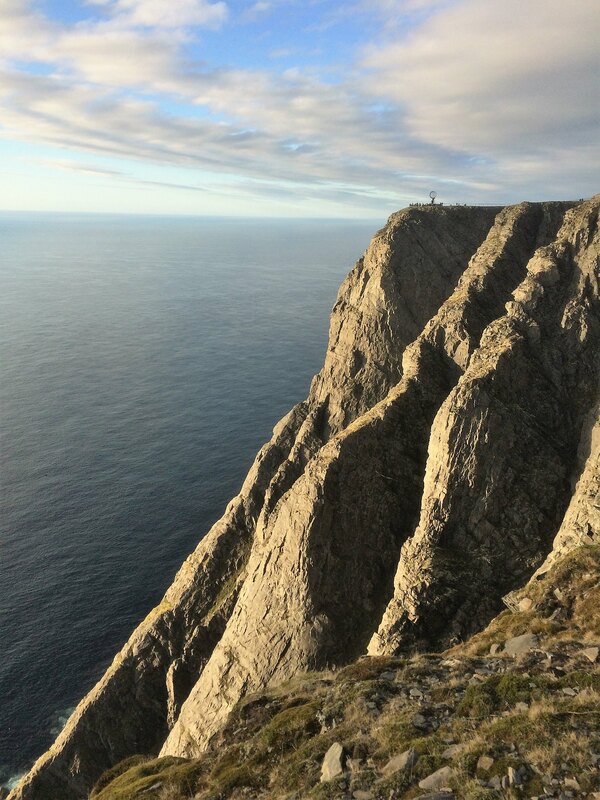 And how good to be here and not in the Nordkapp area. 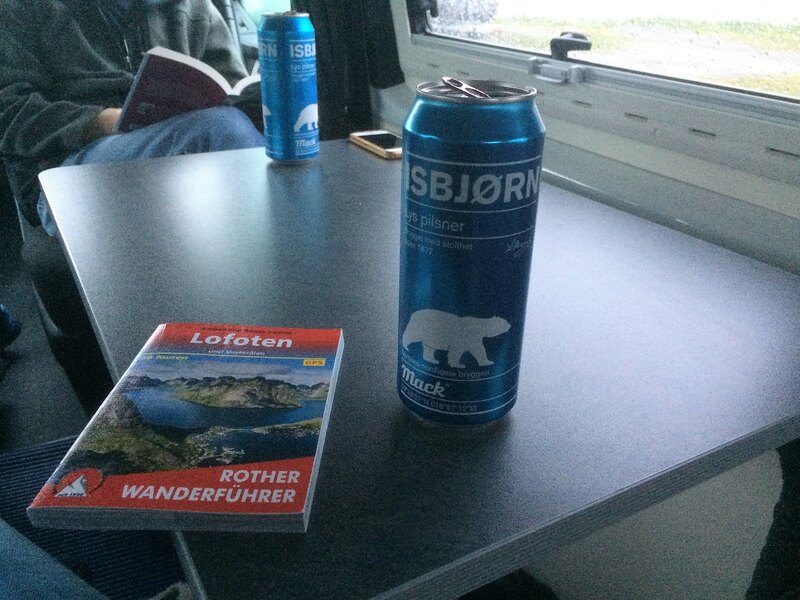 So we started early to go to Gryllefjord. The shortest way was leading over gravel roads. Cold and windy aboard MF Stetind, also a classic from 1977. 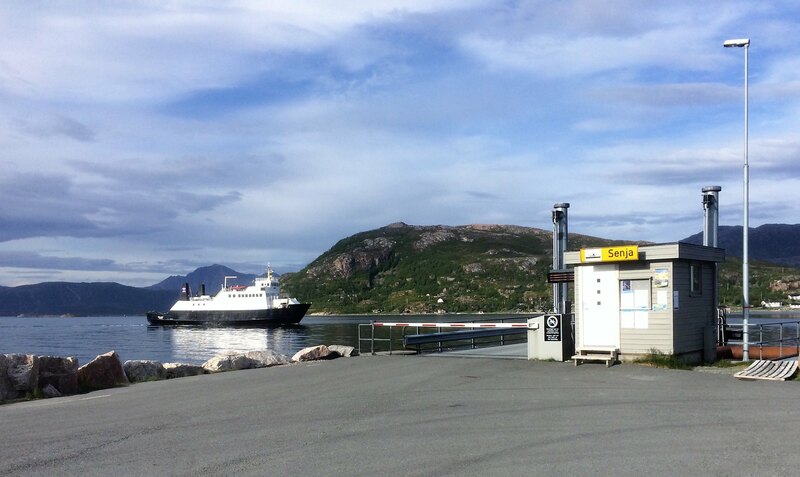 Senja, also still the home of nostagic ferries. 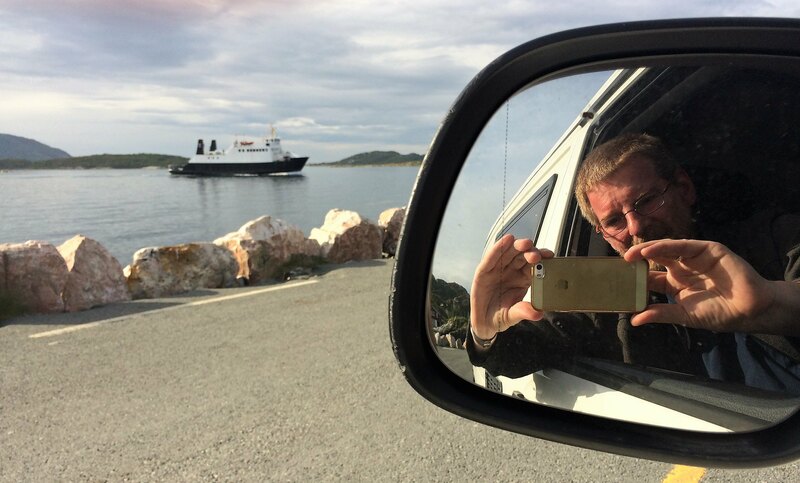 You don't have such views on new ferries --- at east as passenger. 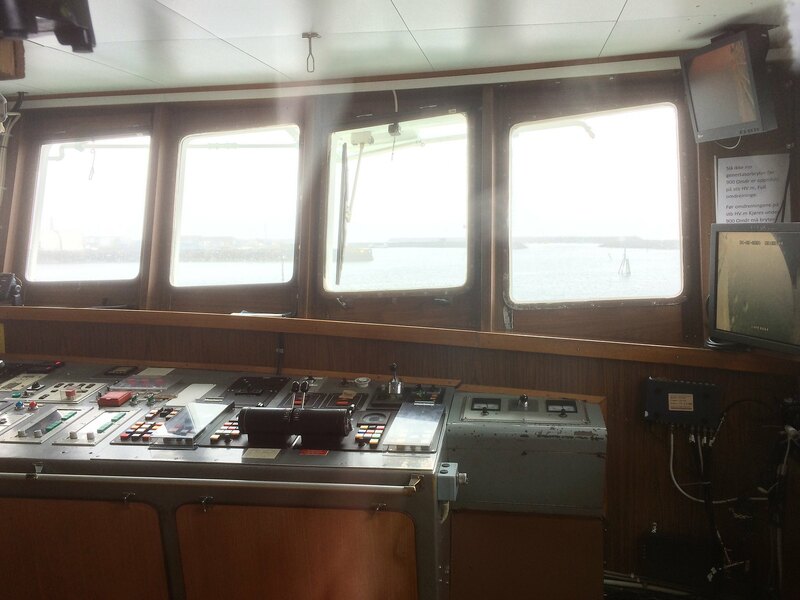 View through the bridge as we approached Andenes. Last night Regine had a small accident with her glasses, which were bended heavily. 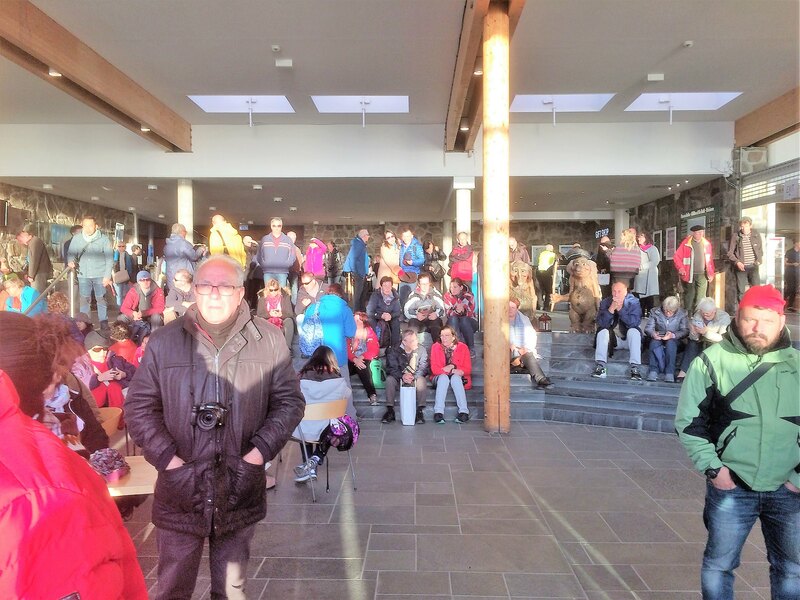 We checked the internet and found a optician shop in Andenes. So we decided to have a visit there. But - in the remote North - the shop was open only once a week: Wednesday!! What should we do now? Well there was a tool shop at the entrance of the harbour. Maybe they would have a suitable tool? The owner was talking to another customer, so we had a look. And there was a large variety of pliers, tongs and pincers. A short try and the problem was fixed! Then the owner wanted to help us, but happily we explained him our problem and how we solved it. I offered to make a donation for the kitty (coffee money pool), but he laughed and told us that he was very glad that we were able to help ourselves in his shop! Since it was raining continuously, we decided to do something indoor and hope that the weather forecast for the next day would fit (predicted no rain and open sky). Then we wanted to try to get places at the whale safari. Stokmarknes was on our schedule and so we would just exchange these two days. 200 extra km would be not the big thing, compared to our whole route. 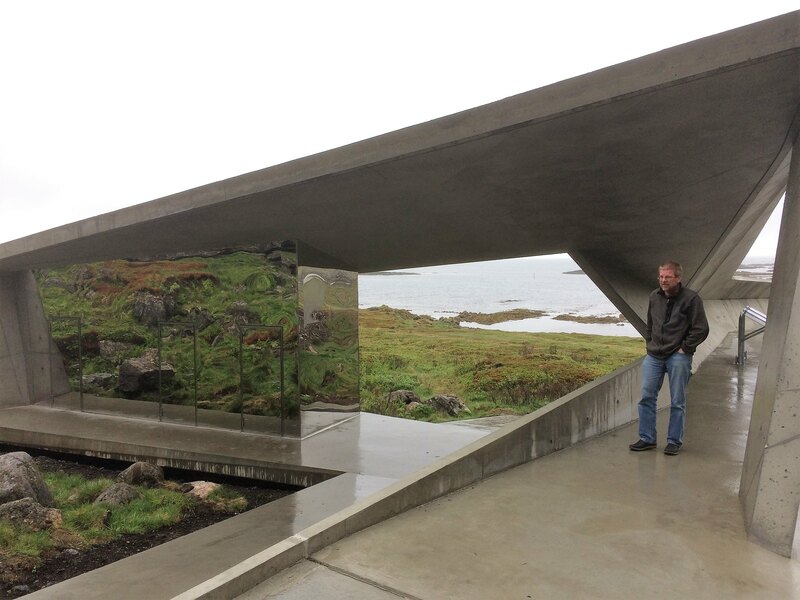 We just wanted to have more time in the Hurtigruten museum than the 30 minutes you are rushing through during a Hurtigruten trip. And so we did. 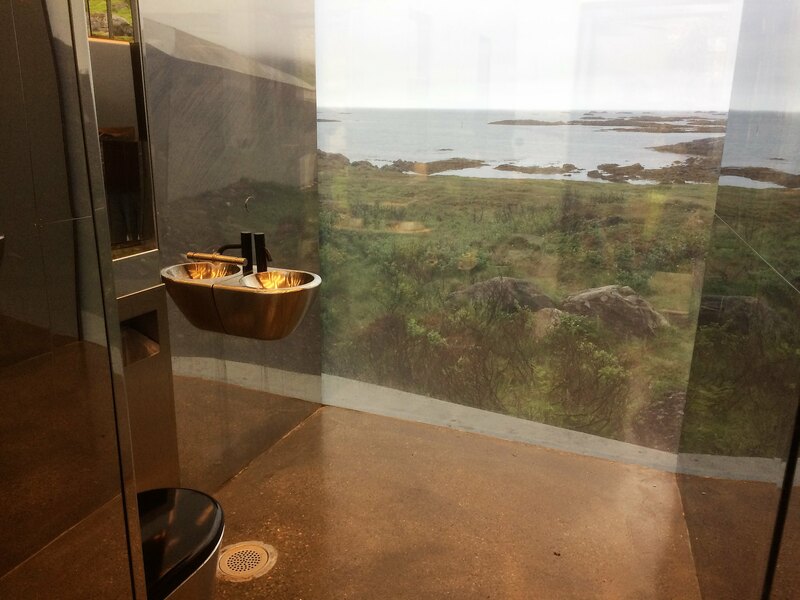 The western shore is also a National Scenic Route, so we took this way and found one of the worlds most beautiful restrooms. You way know it from the "What place is this?"-thread. Not much later we were parking at a familiar place. There are a lot of things happening. So the bridge over the street was closed and we had to change over to get to the ship. 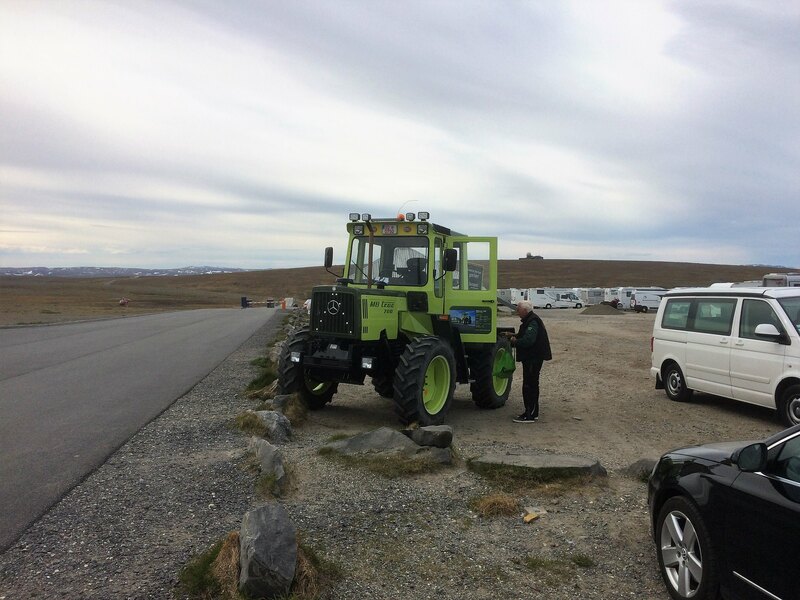 Apparently they are prepaing to move everything over to the bulding near the old MS Finnmarken. We talked to an employee and he stated the building of the hall around the whole ship shall start soon. Inside the ship a huge ventilating system was running and made an incredible noise so going down to the lower decks was a kind of spooky. But we took our time and could also watch the videos in the Museum finally. 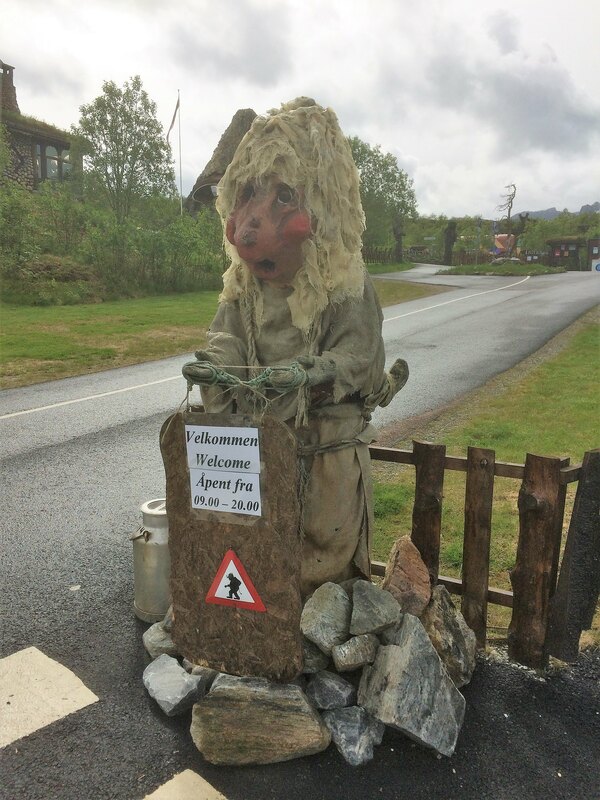 We decided to stay overnight and Vesteralen kysthotel just face to face to the museum is offering also a campsite. And so we got again a pitch directly at the waterfront. A few meters further you had the view on MS Finnmarken, but there was no pitch. To have fresh seafood in the restaurant would be a good idea, we thought, since there were various cars on the hotel parking lot and even a bus arrived. 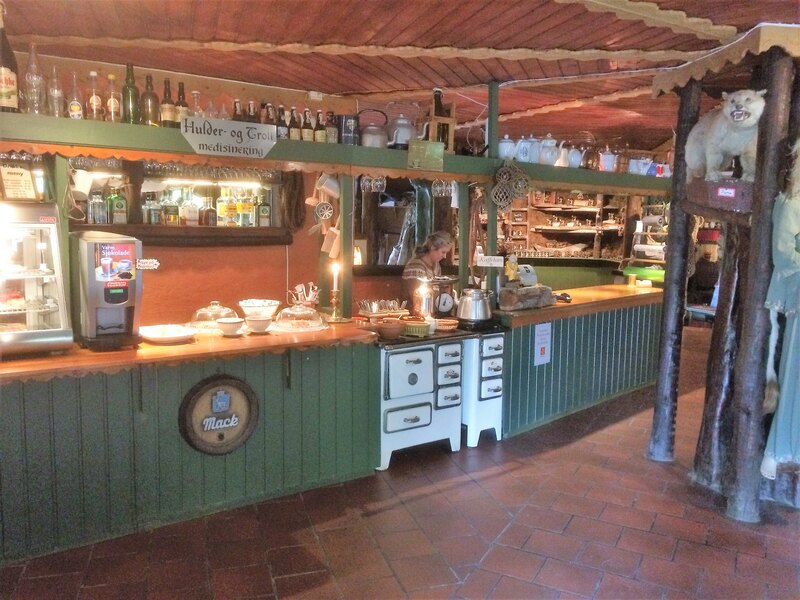 So we asked for their offer, but they had build up a buffet only with very simple food that we would have had cooked even in our campervan without any problems. And so we did. Pity. 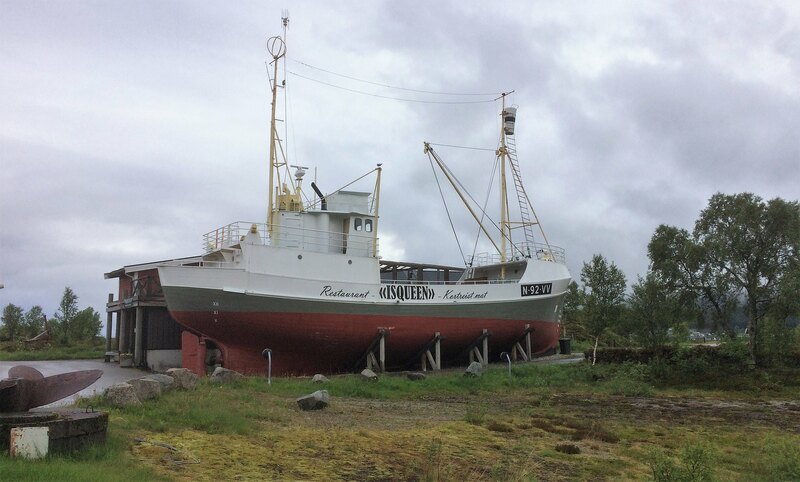 For the the summer season they have even an extra-restaurant in an old fish trawler. But we had to learn: End of June is still no summer season! 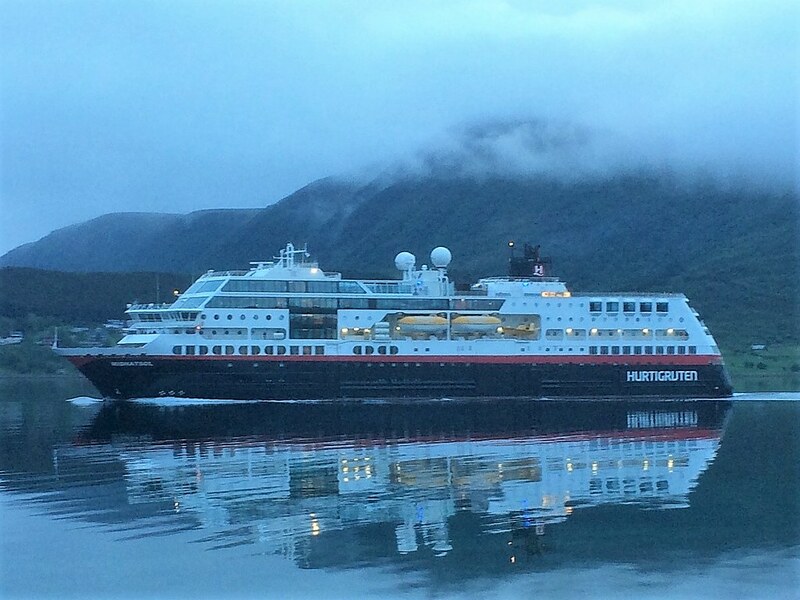 Of course we had to stay awake at such a Hurtigruten spotter place until the northbound Hurtigrute MS Midnatsol came in. As we later experienced, with Mr. Polo UK aboard. Can you spot yourself? Is that a frozen Englishman by the liferaft towards the front of the boat? I think it may be. I'll try to find the matching ship to shore photo later. The sky looked promising the next morning and so we called at the whale safari centre in Andenes to book us in for the next trip. They confirmed and wanted our cell phone number to be able to call us back. So we finished our breakfast and started. 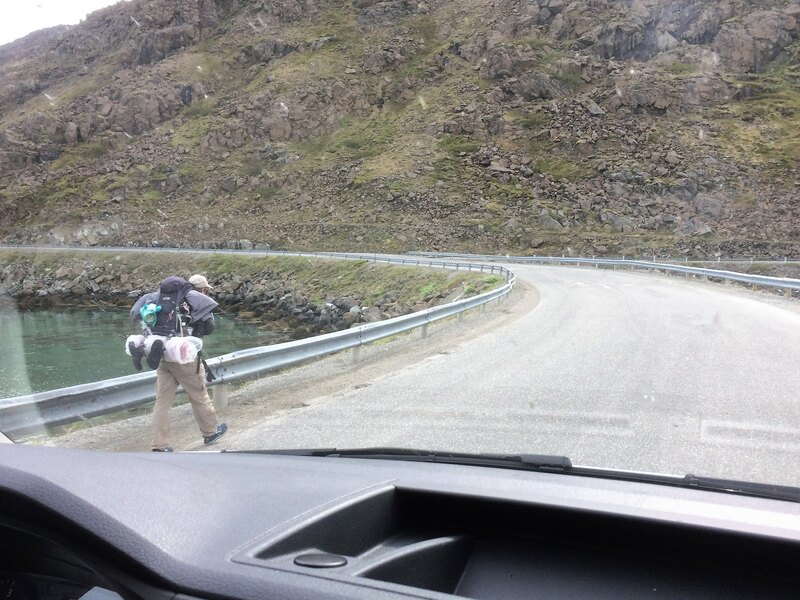 Plenty of time to get to Andenes, but we started as soon as possible. You never know. 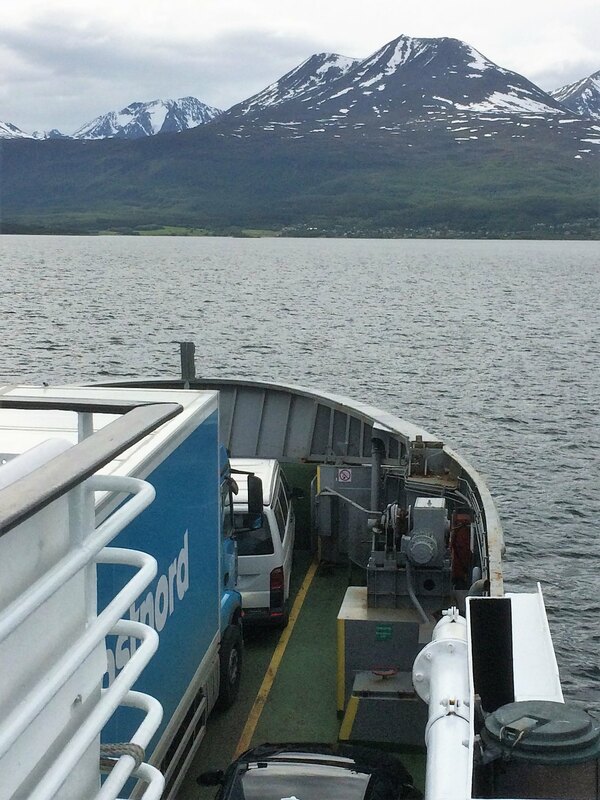 And really, we just passed Sortland as we received a phone call. They wanted to start one hour earlier due to a bad weather forecast for the afternoon. We just checked our satnav. Okay, that should work out right in time. Phew! And so we entered the ship together with a lot of Chinese people who had definitively the wrong clothes and shoes for such a ship. They already were shaking and freezing even when we were still in the harbour. We searched a covered place in the bow for the beginning, to stay dry and warm for the route outside. Quite rough sea was right outside the harbour and so we had hot tea and a lot of biscuits they offered. More and more passengers went quite pale and green and the vomit bags were used frequently. 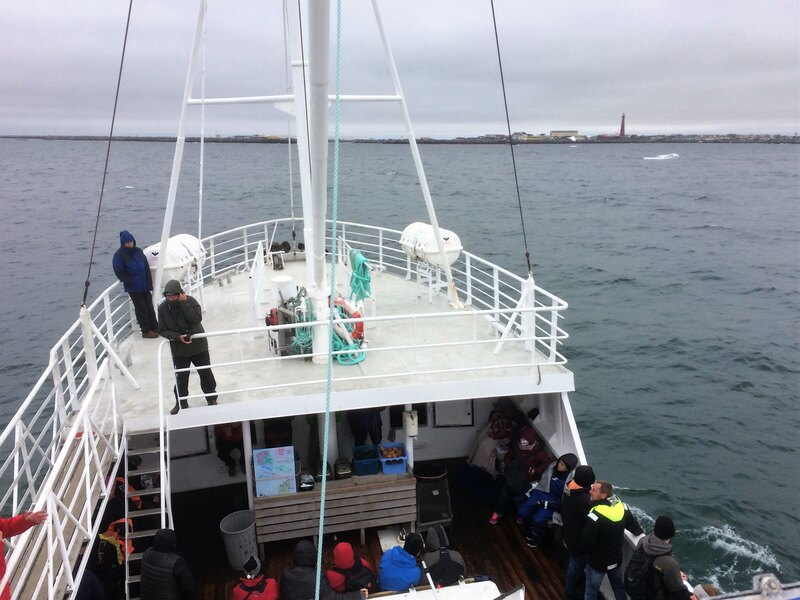 Just as the smell became not funny anymore, the first whales were sighted and we rushed on the upper deck to have the best view. More than one hour we stayed now in this area, the captain always had sonar contact and moved here and there to get the best views. 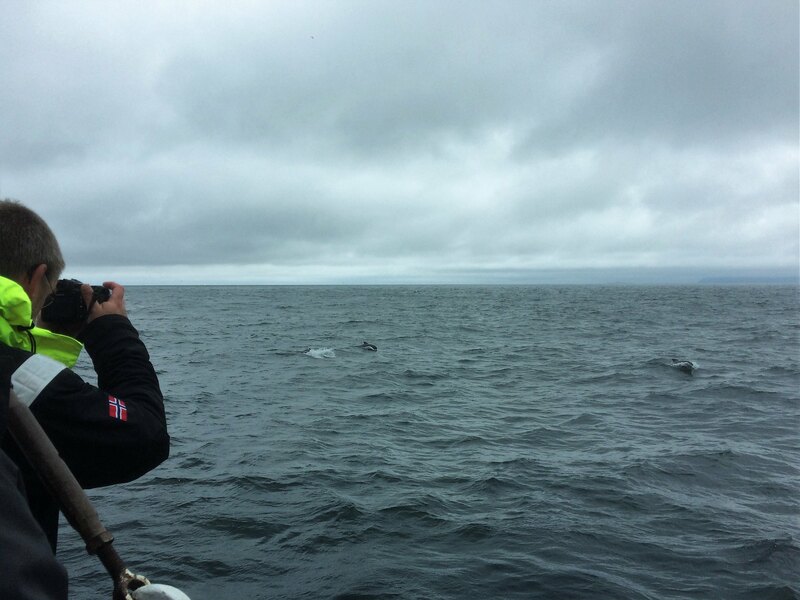 We saw uncountable pilot whales (50-60?? ), a sperm whale and by fortune on our way back into the harbour a humpback whale. The waves were up to 2-3 meters high and so the ship was going up and down, so we had to take care for a safe stand instead of taking pictures or videos. So just one example here. You have to experience that for yourself. I was sceptic, also because of the high price, but it was worth it, because these guys are very professional. It was a great adventure. 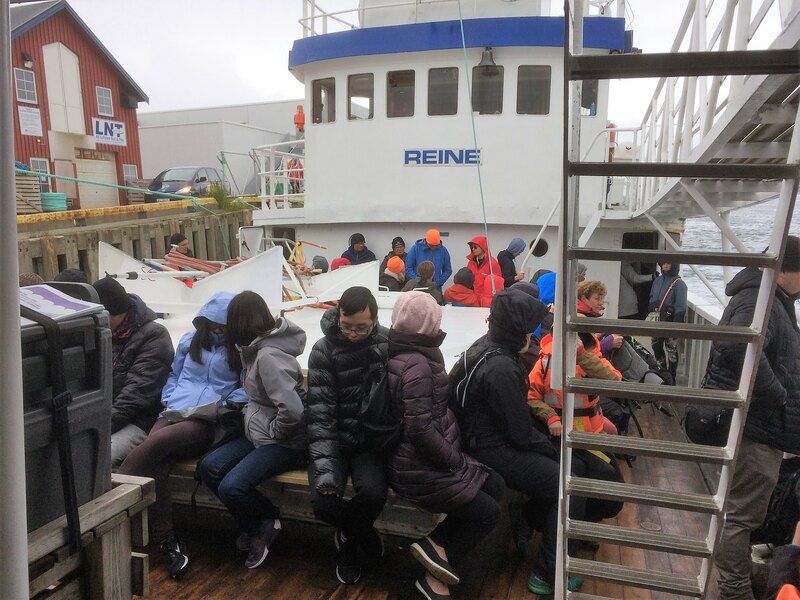 On the way back the crew offered vegetable stew and we had something warm inside before we joined the captain at the upper deck (and spotted the humpback whale). 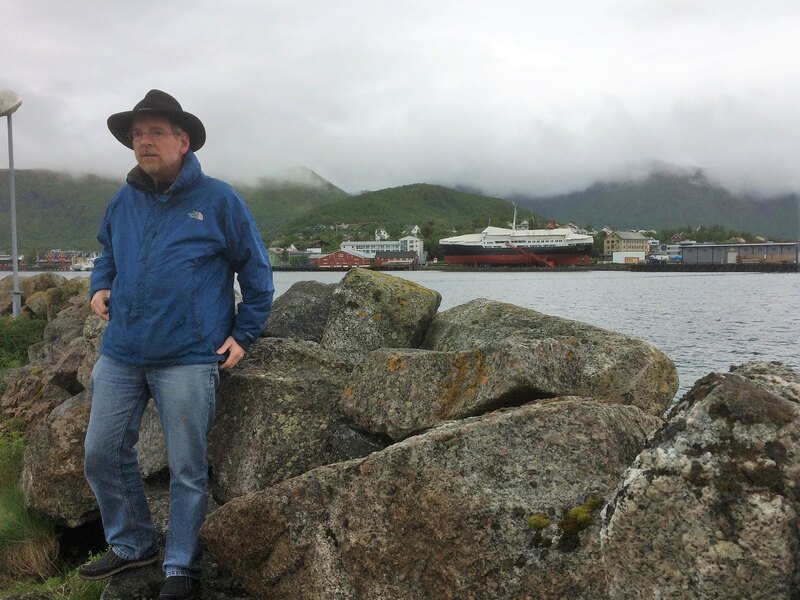 Here we are back in Andenes. Glad that that worked out. We hat just a small spot in lots of rain! 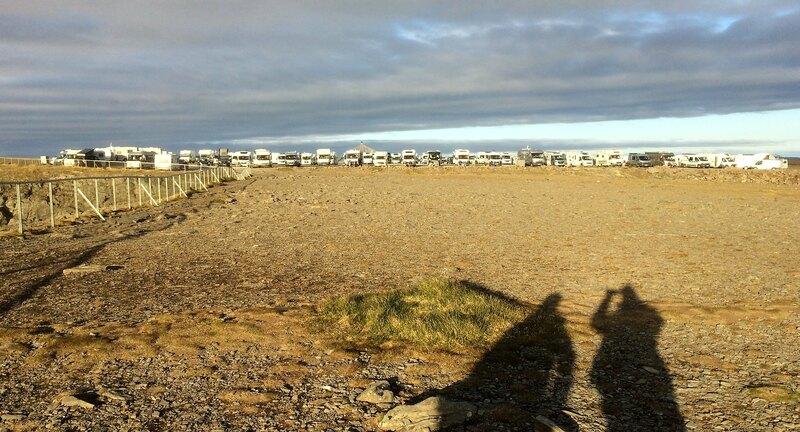 Stave Campsite is advertizing their hot pots, which you can rent for 2 hours and bath lazy in warm water. But it was quite cold and windy outside and we did not want to stay the two whole hours inside the pot and get cold hair, ears and noses. And were were booked on Finnmarken later, there the hot pot is included. Late in the night we finally saw a glance of the midsummer midnight sun. Last edited by Ralf__; November 23rd, 2018, 17:17.